The 2.7 Carrera RS was the result of Porsche’s realisation that the heft of the 2.4 litre 911S was going to restrict the marque’s ability to go racing. It was then decided that in order to fulfil this desire to go and race, the car they had to produce and homologate had to be lighter (weighing only 975kg), more powerful (using a 2.7 litre engine) and have even more performance than the pinnacle of Porsche’s road cars at the time. With this aspiration in mind, Porsche then put the 1973 Carrera RS into production. The car proved incredibly popular with 1,580 lightweight variants being produced, far exceeding the 500 needed for homologation. The racing pedigree of this car was immense, clearing up title after title, however, it was due to the second-place finish at Le Mans in 1974 that Porsche realised that in order to push their competition cars to the next level, there needed to be some experimentation with a forced induction engine. This then led Porsche to start developing the ‘911 Turbo’ in order to meet homologation requirements. A new engine for the 911 was already in development, codename 930, and it was by turbocharging this engine that Porsche developed the first 911 Turbo road car, which in turn homologated a series of new race cars in the form of the 934 and 935. These cars would go on to dominate their respective competitions, winning the 24 Hours of Le Mans in 1979 as well as 6 wins at both the 24 Hours of Daytona and the 12 Hours of Sebring. The 930 engine was also used in naturally aspirated form in the new 911 Carrera 3.0, a model offered by Porsche for just 2 years (1976-1977) to fill the gap between the end of 2.7 Carrera production in 1975 and the launch of the new 911 SC in 1978. As a result of its short production cycle the numbers produced are far lower than most 911 variants, including it’s much sought after predecessor, the Carrera 2.7. Just 2,564 coupés were produced in total, exactly how many of these were RHD is not known but estimates have put it at 10-15% of production, either way, we are talking very small numbers indeed. This rarity is the reason we are so excited to present this stunning example at The Classic Motor Hub. 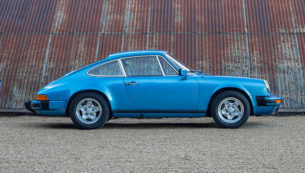 This right-hand drive 911 Carrera 3.0 currently offered by The Classic Motor Hub is a wonderful example of a fantastically maintained and looked after variant of a surprisingly rare 911 in the stunning and sought after colours of Minerva Blue with Brown leatherette with the iconic and very 70’s tartan inserts. Registered new in June 1977, the very early history of this car is not known but according to the V5 there are just 3 previous keepers from new. In 2006 this 911 Carrera 3.0 was in the ownership of what we can assume is the 2nd owner, a Mr. J. Dunford who took the car to renowned specialist Steve Bull to have the engine stripped and checked. It transpired that the some of the cylinder barrel studs had broken, a common fault from 911 engines from this era. The crankcases were sent away to be re-machined and have the studs drilled out. While the engine was stripped the head was rebuilt with new valves, new timing chains were fitted, all six fuel injectors were replaced, the entire clutch assembly was rebuilt and the gearbox was stripped with all worn synchros and bearings replaced. Once all of this was done, both the gearbox and engine were rebuilt using all new seals and gaskets. Mileage at the time was 91,507 miles, so the engine has done just under 2,000 miles since then. In 2013 the car was bought by a Mr. P. Tan and according to invoices from specialist Chris Turner, the Porsche Carrera 3.0 had only done 500 odd miles since 2006. Judging by the invoices this was a recommissioning after little use, so a new fuel tank and new injectors were installed, the brakes were serviced with new pads and calipers. In Mr. Tan’s ownership the car was again, used sparingly until 2015 when the current owner bought the car to add to his collection. Once the decision was made to sell this 911 Carrera 3.0, the Classic Motor Hub recommended the owner to take the car to Autofarm, one of the leading Porsche specialists in the country, to go through it in preparation for sale. £5,000 later and the car has returned to the Hub and is now ready for sale. This Porsche 911 Carrera 3.0 drives beautifully, pulls like a train and does what all 911’s do extremely well, which is cover ground very quickly with ease and often without the driver being aware of just how quickly! Accompanied by a good history file with various MOT certificates and invoices. The original tools and jack are present, as well as the original dated BF Goodrich space saver spare wheel. There is even an original tag attached to said wheel, stating the BF Goodrich Space Saver did not meet current regulations in Great Britain at the time. This Porsche 911 Carrera 3.0 is now available for immediate inspection at The Classic Motor Hub.